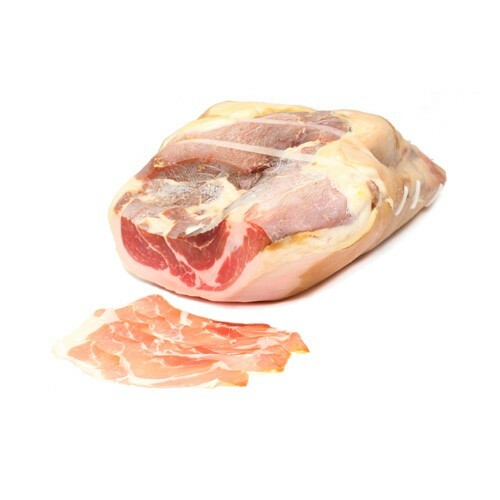 Prosciutto di Parma is one of Italy’s most prized culinary possessions. Its history dates as far back as 2,000 years ago and is made according to strict regulations. The pigs used must be at least 9 months old, weight between 350-420 pounds, and are fed a diet of corn, barley, and whey left over from the production of Parmigiano Reggiano. The hams are treated with only salt and left to age for 10-12 months. Made in the Emilia-Romagna region, this salt-cured, air-dried ham has a sweet, delicate taste that makes it so desirable for eating sliced very thin. The Rotundo variety is a boneless ham that has not been pressed and therefore is somewhat juicier than the traditional flattened prosciutto.